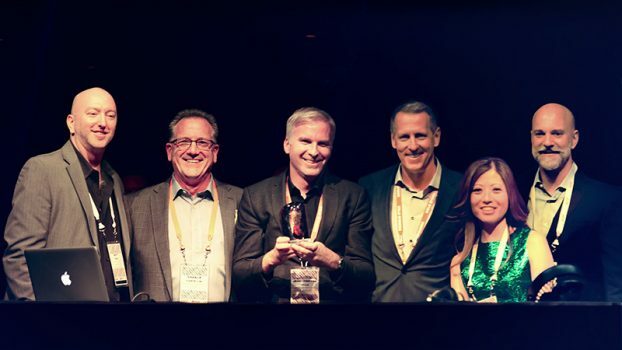 At a recent awards ceremony in Las Vegas, officials at Dunkin’ Brands presented Massimo Zanetti Beverage Group (MZB Group) with its coveted Vendor of the Year award. Company executives representing both companies included, (from left): Matt Daks, Director of Strategic Sourcing, Coffee & Tea, National DCP; Charlie Cortellini, Vice President, Research & Development, Massimo Zanetti Beverage Group USA; Jean-Tristan Villa, Director of Major Accounts & Wholesalers for Massimo Zanetti Group’s Operating Company, Segafredo Zanetti France; John Fitzgerald, Vice President, Away From Home Division, Massimo Zanetti Beverage Group USA; Regina Chin, Executive Vice President, Strategic Sourcing, National DCP; Pete Jensen, Vice President, Supply Chain – International, Dunkin’ Brands. The Vendor of the Year award recognizes MZB’s work done in the calendar year 2017. (OCTOBER 29, 2018) Dunkin’ Brands Group, Inc. (Nasdaq: DNKN), the parent company of Dunkin’ and Baskin-Robbins, named Massimo Zanetti Beverage Group (MZB Group) the 2017 Dunkin’ Brands Vendor of the Year at a recent awards ceremony in Las Vegas. This award is given annually to a vendor that has accomplished significant results for Dunkin’ Brands’ goals. These goals include bringing substantial value to Dunkin’ and Baskin-Robbins franchisees and licensees, generating at least one innovative process, procedure, project and/or product that delivered value to the Dunkin’ and/or Baskin-Robbins systems, and demonstrating consistent, superior execution on day-to-day deliverables. The award recognizes MZB’s work done in the calendar year 2017. Dunkin’ Brands came to MZB Group to respond to its European market needs for an international espresso. Massimo Zanetti’s unique capabilities and market insights enabled the development, production and market introduction of a new Dunkin’ International Espresso Blend. “For years, MZB-USA, the North American headquarters of MZB Group, has supported us with coffee roasting and production. But their speed in responding to market trends, global reach, and resources truly demonstrate what makes MZB Group a valued partner in serving our customers both in the U.S. and internationally,” Jensen added. “MZB Group’s experience in recognizing innovative trends and taking concepts to commercialization sets us apart. Additionally, our global reach with 18 roasting facilities around the world distinguishes us and gives us the ability to execute quickly and efficiently for our customers,” said Jean-Tristan Villa, Director of Major Accounts & Wholesalers for MZB Group’s operating company, Segafredo Zanetti France. For more information about MZB Group and MZB-USA, please visit www.mzb-usa.com. About Massimo Zanetti Beverage USA, Inc.
Massimo Zanetti Beverage USA (MZB-USA) is one of the largest vertically integrated coffee companies in the US and produces branded and proprietary coffee, tea, and drink mixes for the home, office and foodservice. Based in Suffolk, Virginia, the company operates facilities in Portsmouth, VA., Kauai, HI and Moonachie, NJ where its Coffee Away From Home ‘Center of Excellence’ is located. MZB-USA is a leading private label coffee roaster in North America and its globally-recognized brands include Segafredo Zanetti® Coffee, Cold Brew and Espresso, Chock full o’Nuts®, Hills Bros.® Coffee and Cappuccino, and Kauai Coffee® among others. Part of the Massimo Zanetti Beverage Group, the company operates the largest coffee farm in the United States and licenses Segafredo Zanetti Espresso Cafés. For more information, visit www.mzb-usa.com. Massimo Zanetti Beverage Group S.p.A. is a world leader in the production, processing and marketing of roasted coffee and other selected categories of colonial products, distributed in about 110 countries. The Group manages the different activities, from procurement to consumption, operating 18 facilities across Europe, Asia and the Americas, and through a global network of about 400 coffee shops in 50 countries. Moreover, MZB Group completes the range of its products through the sale of coffee makers and complementary products, such as tea, cocoa, chocolate and top-quality spices.